I’m not the biggest fan of vehicles for many reasons including space, price, etc. Three years into Masters of the Universe Classics line, we finally get our first vehicle. The Wind Raider makes the transition between collectible and plaything, and pulls it off pretty well. 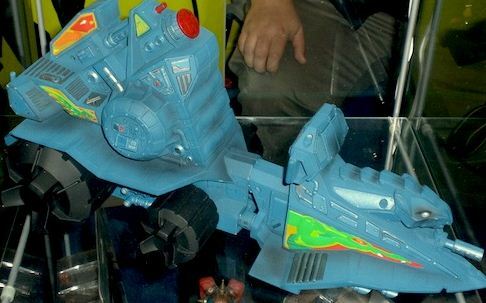 Read on for some insight into MOTUC’s first venture into a more retail than specialty market venture, the vehicle. Back in SDCC 2010, the Four Horsemen’s booth had a very interesting item on display. A remake of a fairly iconic Masters of the Universe vehicle, the Battle Ram. Later in the show they announced there would be a vehicle in the final quarter or 2011 … leaving us all to assume it was going to be this. Well it wasn’t. And there is no vehicle scheduled for 2012, so that Battle Ram will probably end up like those 200x MOTU designs the Horsemen showed off shortly after the retail line was canned. But the good news is we did get the Wind Raider! So yes, the Wind Raider was not my first choice for a vehicle. I was apprehensive towards the whole vehicle idea as a whole anyway, I don’t really like to have them especially with 6″+ scale toys. It probably even came down to the last minute or so before the sale when I just said “screw it,” and went and ordered. When the box finally arrived, I was a little underwhelmed at the size of the box. It seemed really small. It also sais “Battle Ram Chariot” on it for some reason. 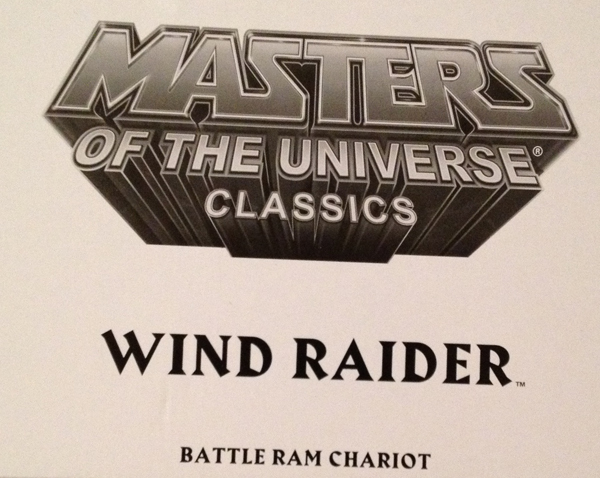 But regardless of that I ripped open that box and put together my Wind Raider. One thing I did like about the assembly process was that I did not have to put any decals on. I could get used to that because I hate adding decals … I can never get them straight and they ware off in time. Also after assembling the Wind Raider I found out it was actually pretty big. That small package is deceiving. The Wind Raider also comes with a flight stand that adjusts, so I can pose it flying in any direction. If I do not want to have it on the flight stand it has wheels on its base so I can zoom it across my floor. There is an action feature, the anchor on the front will fire when you hit a button. The engine flaps open to reveal the interworkings. There are so many good things going for this vehicle. It really is a great start to getting these types of products into the line. I only really had one problem with it, the price. It’s easy to see the $20 (now $22 welcome to the new year!) price and think “$45 is a great deal for all we are getting!” But to be honest it really isn’t. I think the original intended $40 price would have been a little easier to swallow, but this is an expensive line. Things are only going to get more expensive. I do feel this is a better value at $45 than the giants were at $40, if that’s a consolation prize or whatever, I don’t know. Overall I am satisfied with the purchase. They needed to hit it out of the park with their first vehicle and I believe they succeeded. It’s a great vehicle, my son loves it and I think anyone who can pick one up will enjoy it too.